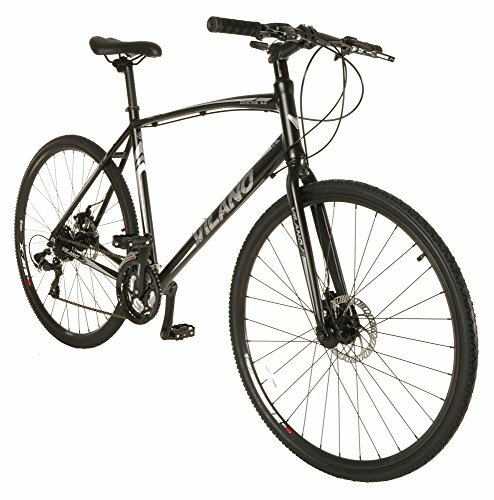 Hybrid bikes refer to a bike you can use for mountaineering, hiking, or even for regular use. A lot of men nowadays also use hybrid bikes to achieve their desired body shape. Hybrid bikes can speed up the process of working out, and the good thing is that you don’t need to hit the gym when you feel like exercising. Today, we are going to review the top 10 best hybrid bikes for men. This guide will help you choose the best hybrid bike for you. The following are the most durable and highly-efficient hybrid bikes in the market, so let us get started. Another product from SixThreeZero, we have the EVRYjourney men’s hybrid cruiser bicycle in sleek matte black color. 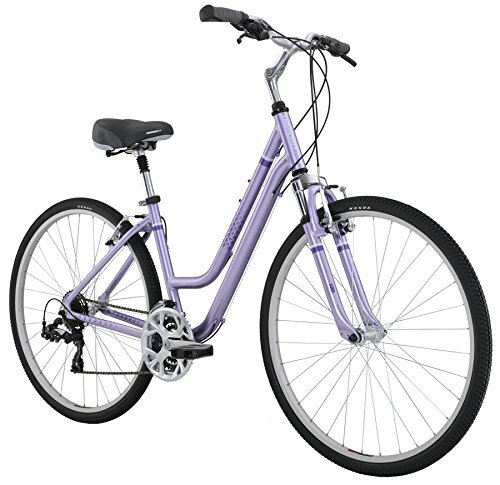 It features a 19-inch swooping aluminum frame that you can use in a variety of biking activities. This bike promotes good posture of shoulders and the back thanks to its upright riding style. The foot-forward design can help in maintaining proper leg extension. Also, it has a seven-speed Shimano external hub that you can use for long distance rides. It features a front and rear handbrake for your safety. Its matte black frame has matching comfortable dual-spring saddle and grips. It also includes matching fenders and rear racks if you want to have baskets and panniers. The 26-inch and 1.95-inch wide whitewall semi-slick tires will keep this bike stable during the entire ride. Allow us to introduce the Schwinn Men’s Network Hybrid Bicycle. 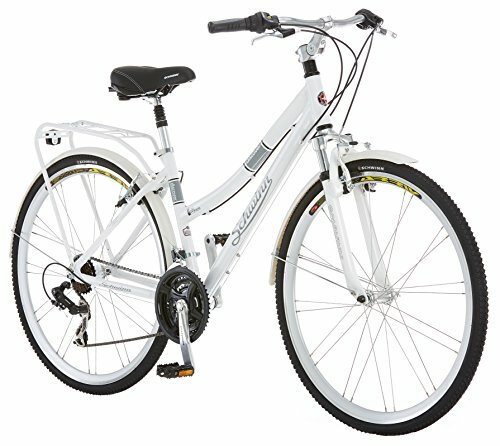 It features an aluminum hybrid frame with a suspension fork for optimal use. The bike has Shimano 21 speed rear derailleur with Shimano EZ fire shifters. If you are planning to join a biking competition, we recommend this bike to you. The alloy rims are lightweight and robust. It also features a quick front release. The padded comfort style seat with suspension seat post will keep you comfortable even if you ride the bike for the prolonged time. It also helps in promoting good body posture. This bike features a swept-back handlebar for the perfect upright riding position every time you use it. We also have the Vilano Diverse 3.0 performance hybrid road bike with 24 speed Shimano Disc Brakes. This road bike features 700C wheels that can withstand even the harshest road bumps. The hydroformed alloy performance hybrid frame and fork provide full control while riding the bike. Also, its disc brakes can provide excellent stopping power. The upright handlebar is designed to provide optimal comfort. This bike is not only affordable but also durable. You can use it for everyday commuting or recreational purposes. The frame is made of premium aluminum that’s built to last. Its Kenda tires will give you the confidence to use the bike ruggedly. 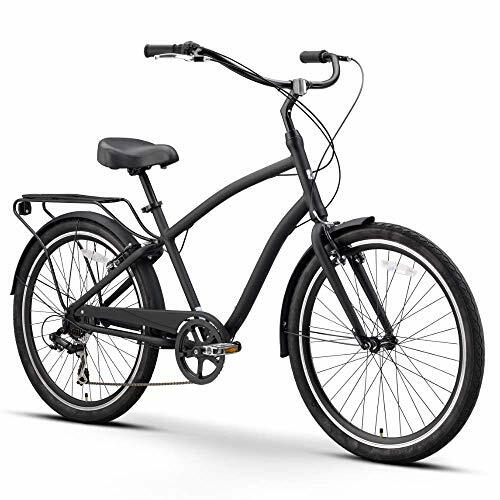 The Kent Northwoods Springdale hybrid bicycle in sleek black color. It has a lightweight aluminum frame that allows you to carry the bike anywhere you want. Also, it features 21 speeds that you can shift without difficulty. This hybrid bike features the Shimano Tourney rear derailleur. Its 700C alloy rims can withstand the everyday rugged use of the bike. It has a linear pull brake and alloy quick release seat clamp for optimal comfort. It even comes with a rear crack at an affordable price. You don’t have to drain your bank to enjoy riding a quality hybrid bike for recreational and commuting purposes. 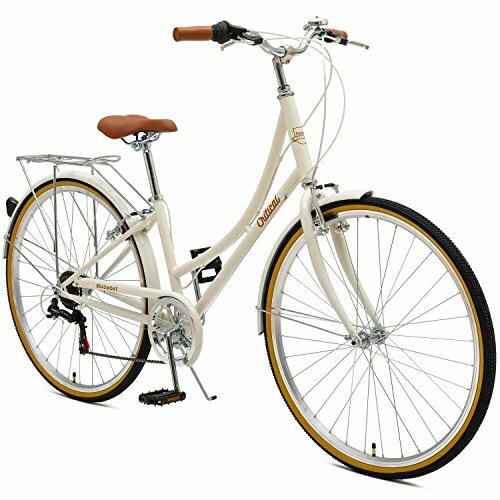 First on the list is the SixThreeZero hybrid cruiser bicycle. 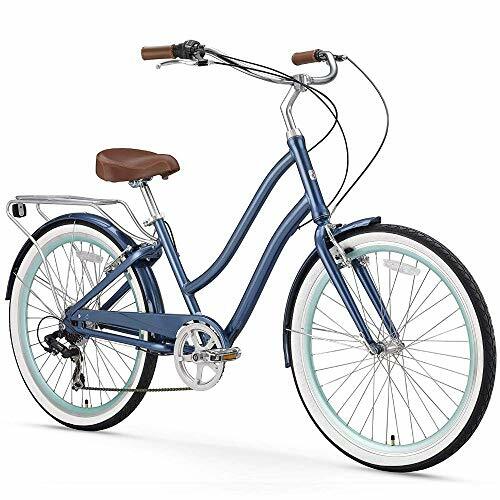 This versatile bike features a 17.5-inch swooping step-through aluminum frame that’s ideal for cruising, leisure, and commute rides. It has an upright riding style that keeps your back and shoulders comfortable, even on extended trips. The foot-forward designs can help in maintaining the proper leg extension of your body. 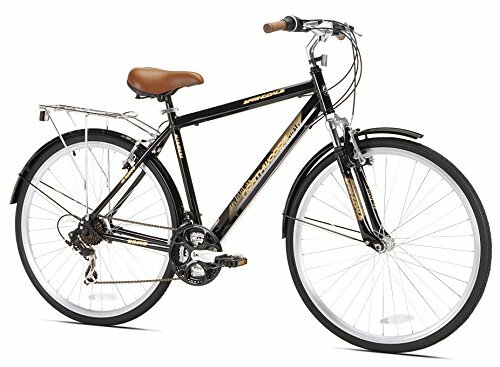 This bike has a 7-speed Shimano external hub that allows you to explore a wide range of biking activities. It has front and rear handbrakes for your added safety. Now you can travel in style with its curvy frame and dual-spring saddle that includes a matching fender and rear rack for optional baskets and panniers. The 26-inch and 1/95-inch wide whitewall semi-slick tires provide a cushioned and stable ride for easy rolling. 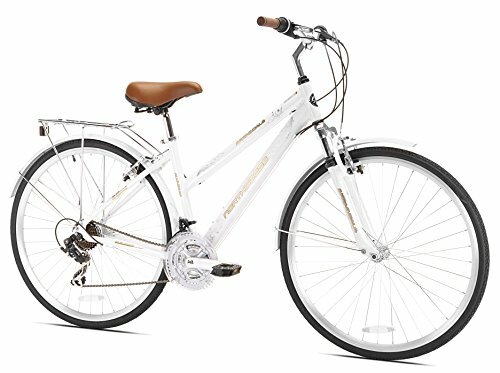 We also have the Schwinn Discover Hybrid Bicycle with aluminum city frame. 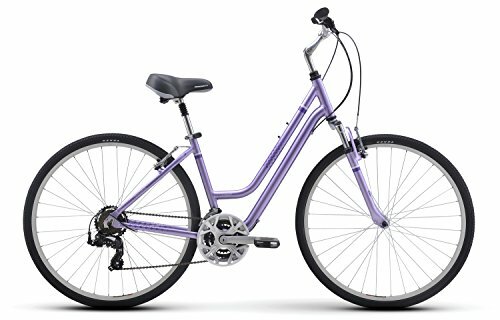 It features the Schwinn suspension fork and Schwinn alloy crank. The structure is engineered for urban riding and features a front suspension fork to make utility hole covers and pavement patches easier to take. It has an integrated rear crack and ready to carry your back while riding. You can choose from 21 speeds with its Shimano twist shifters and Shimano rear derailleur. An ally front and rear linear pull brakes for your safety together. It has a suspension fork that helps in maximizing the bike’s response and a swept-back handlebar with an adjustable stem for an upright position. This bike is built to fit just about anything you wear or anywhere you want to be. Not to mention, it helps to promote proper exercise routine on a daily basis. You might want to check out the Diamondback Bicycles. It features an aluminum sports hybrid that’s durable, solid, and engineered with an upright yet comfortable geometry to keep alert yet aggressive in the saddle. 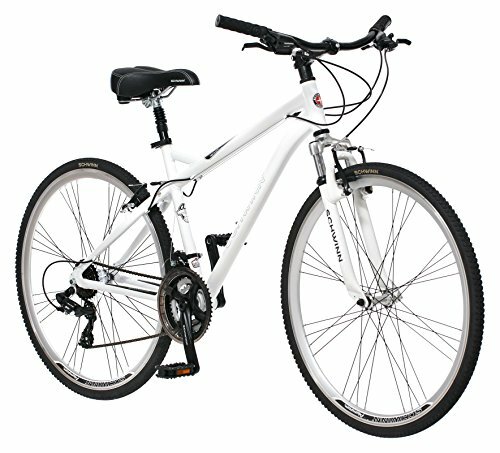 It also has a comfort suspension with 63mm of travel that allows you to travel downhill in decreased risk of accidents. The steel handlebar adds strength on the front end. This bike also features the DB Kraton grips that absorb the bumps in the road to lessen the fatigue in your hands. The Drivetrain offers 21 gearing options. The SSW700 double tunnel aluminum alloy rims and Kenda tires are engineered to perform very well regardless if it’s a rocky path or smooth pavement. If you are on a budget, you might want to take a look at the Kent Northwoods Springdale hybrid bicycle. It has a lightweight aluminum frame and 21 speeds to choose. This bike also features a Shimano Tourney rear derailleur. Rest assured that the 700c alloy rims can last for a long time. The linear pull brakes and alloy quick release seat clamp ensures your safety while riding the bike. This bike is designed for both commuting and recreational activities. You can adjust the settings the way you want, especially if you’re going down hills or climbing up. The upright comfort-rise handlebars will keep you in a comfortable riding position. It also helps in lessening the fatigue in your hands even if you use the bike for the prolonged time. We also have the Critical Cycles Beaumont-seven speed urban city commuter bike. This lightweight hand-built-step thru steel frame with an upright riding position will allow you to use the bike in a variety of recreational activities. This bike is equipped with Shimano 7-speed drivetrain and RevoShift grip shifters that provides ultimate precision, speed, and control. It also has front and rear alloy brakes that will keep you safe and provides full control during the entire ride. The Wana 700x35C tires grip the ground for a dependable ride every time you use it. For the installation, compared to other bike models, this one arrives 85% built. The package includes all the assembly tools that you’re going to need and a well-written instruction. All you need to do is finish putting together the bike, and you’re good to go. Another product from Diamondback Bicycles, we have the complete hybrid bike with aluminum frame. It features an upright riding style to keep the pressure off your spine as you ride your bike. The comfort suspension has 63mm of travel that will allow you to go downhill with decrease risks of accidents. This bike has a steel handlebar that adds more strength to the front end. Its DB Kraton grip will absorb the bumps in the road, making this bike ideal to use in recreational activities. The Drivetrain offers 21 gearing options, allowing you to gain full control of the bicycle while reading. On the other hand, the SSW700 double tunnel aluminum alloy rims and Kenda tires are ideal to use in both muddy roads and smooth pavements.